Please let me know what you are looking for and I will look over the Dutch, even European horsemarket to find your next dreamhorse. Please let me know your preferences in age, gender, trainingslevel, dressage or jumping. 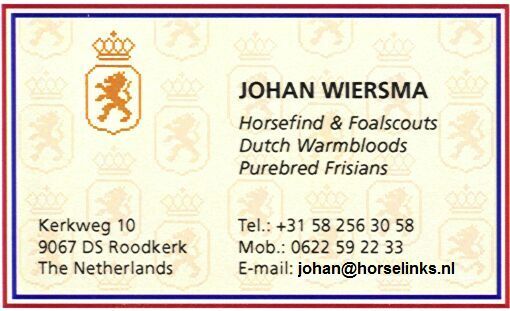 Our Saleslist is shortened as it is expensive to have too many goodhorses in stock while we have a wealth of connections in the trainers community to find an excellent horse for you , Warmbloods or Frisians, in different trainings levels, also colts, fillies and broodmares from the best motherlines we will trace for you. We provide an unique service of finding exactly your dreamhorse for the best price / quality ratio. If in our saleslist is not the horse of your preferences please don't hesitate and mail us with the description of the horse you are looking for. We meet you at Amsterdam Airport and drive you to the horses meeting your preferences, 1 or 2 days will give us sufficient time for you to try out the horses, hands on, please bring your boots and helmet. Also Colored Warmbloods, nice selection! Once you select a horse you want to buy, we let the owner know that you are going to buy it pending your vet’s approval, will have it vetted as soon as possible, and ask them to hold their horse for you. We have never found a need for our buyers to pay a deposit to hold a horse. What is the vetting process? We ask you to get from your vet the list of x-rays they wish to see and any other instructions or tests they wish to have performed. We will need you to give us the name and mailing address, fax and phone number of the vet you want to receive the x-rays and vet report. What is the cost of vetting? The cost of vetting varies widely, from about $500 to $1,000 or more, depending on the number of x-rays your vet wants to see or any special tests they want performed. The cost you pay for the vetting will include the courier’s fee to deliver the vet report and x-rays directly to your vet within a few days. We ask you to first wire the money over for vetting the horses and then, once your own vet approves your purchase, wire the money over for the horse and any other expenses still due. As of September 2006, it costs roughly $ 5,200 to import a Dutch Warmblood gelding into New York, including all ground transportation, the flight over, and the USDA 3 day quarantine stay and expenses. The cost to fly horses into Los Angeles is about $700 more. These prices are beyond our control and are subject to change as well as the fluctuation of the currency exchange rates. The USDA quarantine stay is normally 48 hours, during which time they will repeat the blood tests for the same four diseases your horse will have been tested for in Europe if you do the pre-quarantine bloodwork over there as well. We highly recommend this duplication because if the horse tests positive for any of those diseases, it will be your expense to fly it back to its country of origin. If you are importing a mare or stallion above two years of age, they will require CEM quarantine in addition to the USDA quarantine, at an additional cost. There are several facilities our clients have selected for CEM quarantine of their new horses. Cornell, in Ithaca, NY charges an average of $1,400-1,500 and keeps the mares about two weeks. Kentucky offers a facility that keeps mares for three weeks and charges $950 for their stay. There is also a facility in Rhode Island Stallions require a longer CEM quarantine, lasting four to six weeks, during which time they must breed two test mares by live cover. So all together 6000 or 6250 CAD lands yr horse in Toronto, the buyer should have on her farm or else a stall at the ready inspected and approved by Canadian authorities to keep the imported horse for another 30days in quarantine. We will make the necessary importation arrangements through the USDA quarantine for your new horse. The US Shipping agents we use can help you with any transportation or CEM quarantine arrangements after that point. You will have to arrange to have your horse picked up at the quarantine facility as soon as they are released. Your horse’s US shipping agent will be able to help you make those arrangements, as well as arrangements for CEM quarantine, if necessary. Contrary to popular belief, international bank wires are not instantaneous. It usually takes about two days for the funds to be available over there. Once the money for the vetting has been received in Europe, we should be able to get your prospective horse vetted within one week. Once your vet approves your purchase, and you wire your money over to buy that horse, we should be able to get it over to the US within two weeks or so after receipt of your funds. We recommend that you insure your new horse as soon as you wire your money over to purchase it. Some companies offer transit insurance, which is a good idea to have during the importation process.